The Nipmuc tribes were living across most of Massachusetts when the pilgrims landed at Plymouth Rock on Dec. 26, 1620. The Wampanoags were the coastal tribe who helped the pilgrims get a foothold - but the Nipmucs came in relatively quickly to open friendly trade relations. The religious fervor of the pilgrims worked quickly - by 1674 they had already set up numerous "praying towns" across Massachusetts where they helped re-educate the natives in the ways of Christianity. The first praying town set up was Natick. The second was Hassanamesit, located in what is now Grafton. This town was exactly in the center of two primary Native American pathways. 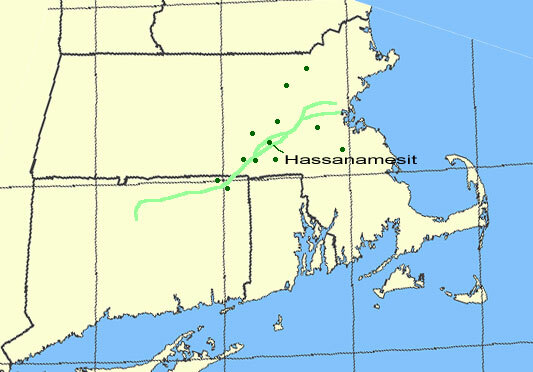 The Nipmuc name means "place of small stones". On the map below, the green dots are the praying town locations, and the light green lines are the main Indian pathways. In 1704, the land grant that was made to a group of settlers for "Sutton" explicitly was set to contain the Hassanamesit praying town. As the years went by, parts of that original grant were "broken off" to form other towns. Hassanamesit is now a 2.5 acre Nipmuc reservation, and every summer it is the location of a Nipmuc public powwow.